The keys to having a quality life in the Golden Years are good health and having a meaningful life! 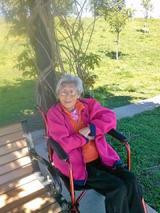 She was strong and stubborn and pushed the Grim Reaper away many times to continue her journey as a great role model. Susan had a good set of keys making it to 100 years 5 months and 8 days! A few of MANY awards for Susan. 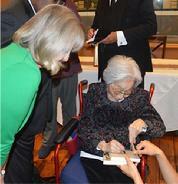 Signing her biography at her 100th for Joanna Kim her nephew Robbie's wife. 2013 In n Out near her home in Northridge. Susan loved to eat! 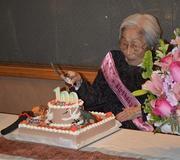 January 16, 2013 Susan at her 98th Birthday Party at Yong Su San Korean restaurant in Koreatown. About 25 of her close friends and family gathered for a nice evening. 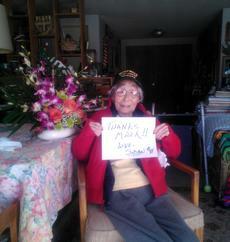 Susan at her home letting Mark Ridely Thomas she appreciates the flowers he sent for her birthday. Mark and Susan have been great friends for a long time. April 19 Visiting Lake Balboa with Daisy enjoying a very nice Spring Day! 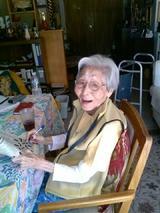 Happy at home doing a crossword puzzle!